I didn’t get to post this last night because I went to see The Hangover. Sorry, but even bloggers need a night off every now and then. The other thing I accomplished last night is the topic of this post. I went with a few of my coworkers to the opening night of the Ventura County Greek Festival. Ventura County Greek Festival – At the Camarillo Airport (see website for driving directions) June 12, 13 & 14. Honestly, for a history major, I don’t know a lot about Greek stuff. I know that Greeks invented democracy and city-states and gyros. Other than that, I’m pretty ignorant on the whole topic. Which as most of you know, is extremely painful for me to admit. And it’s for that reason (and the fact that I got a free ticket) that I chose to take this chance to learn a little more about my greek brothers and sisters. This festival is going on all day today and tomorrow. The hours for today are 10:30am to 9pm and tomorrow they’re open from 10:30am ’til 7pm. Rather than giving you a review on the event and then making you wait an entire year to actually attend, (strawberry festival/cajun festival) I’ve decided to give you a few highlights and hopefully encourage you to check it out this weekend. 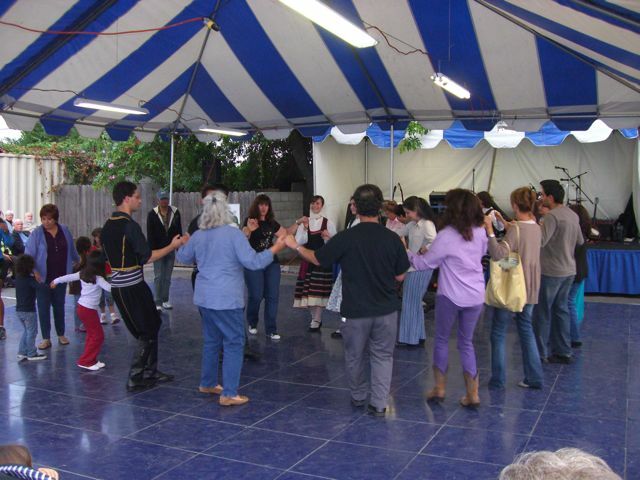 The Ventura Greek Festival is held at St. Demetrios Greek Orthodox Church in Camarillo. The price of admission is $4 but if you bring the coupon from their website, it says that you’ll get $2 off the price of your ticket. Either way, it’s a dirt cheap price to pay for a festival. As usual for these events, kids get in for free. In this case that includes all non-teenagers (12 & under). I like to think of this as “the little festival that could.” What it lacks in size and grandeur, it more than makes up for in personality. The two big attractions here are the dancing and, of course, the food. Since I’m not much of a dancer, I left that to the pros and stuck to the eating. There are other things to do as well, like getting your face painted, doing a little shopping from the local vendors and letting the kiddies play on the huge inflatable slides. Like I said, I ate. Actually, I had my first gyro ever and I must say that it was great. They have a dedicated gyro booth and the line moves quickly. It’s $6 for a sandwich and most of the other food items at the festival fall into the $5-6 range. The picture doesn’t really do it justice, but for the price, you get a good amount of food. 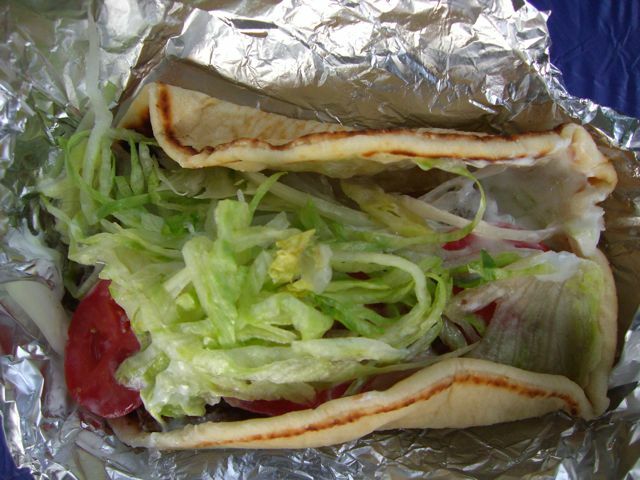 For those of you who don’t know, gyros are pita bread sandwiches. They are made with a beef/lamb mixture, lettuce, onion, tomato and a yogurt sauce. The pita is grilled slightly to give you a little bit of crunchy texture. I got the gyro and then headed over to the calamari booth for a little more savory food before hitting the sweets. 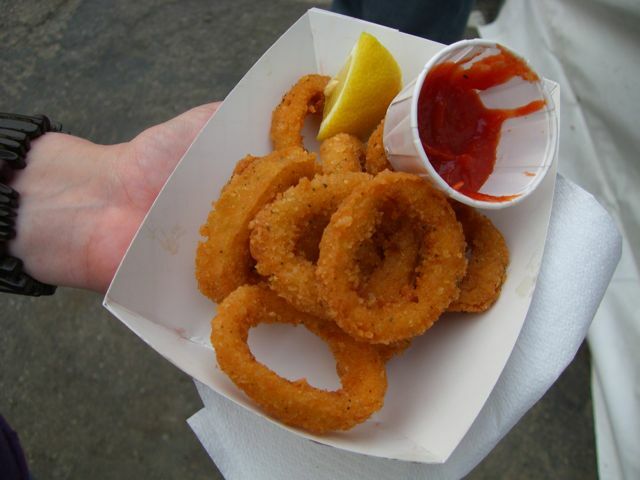 The calamari was pretty standard festival fare. The breading was thick, as were the pieces of calamari. I think there are a lot of great options here, so I’m not sure if I can recommend this. But if you’re a fan of calamari, then it’s probably worth a shot. The other food options include an hors d’oeuvres booth, where you can get spanakopita (a spinach and cheese puff pastry dish) hummus, Greek meatballs and stuffed grape leaves. If you’re in the mood for a whole meal, the Greek at the Harbor is there too. They have 3 or 4 different options, including souvlaki, a grilled pork kebob. The dinners also come with all the trimmings, like olives and feta cheese, rice pilaf, Greek salad and a lot more. They didn’t serve the pastries with empty wrappers. Our group just couldn’t hold out long enough to let me get a photo. This is the variety pack that you can buy at the sweets tent. 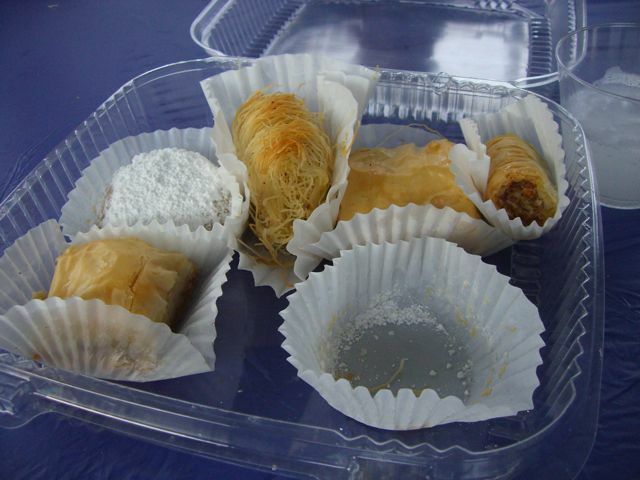 It includes 5 different types of Greek baked goodies. My personal favorite is the Saragli (sarah-GLEE), which is a lighter crispier version of bakalava. You also need to try the loukoumathes. 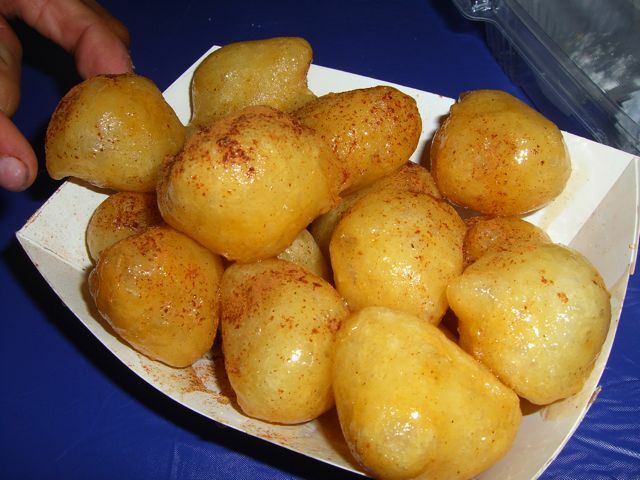 These are little fried pastry puffs that are coated in cinnamon and honey. They’re essentially a Greek donut. It wouldn’t be a greek festival without Ouzo, the anise (black licorice) flavored liquor. Be sure to try one in the covered patio section around the back side of the festival. If ouzo isn’t your thing, you can also sample some really great Greek wines instead. Okay, it’s 10:50 right now, which means that I’ve overshot the opening by 20 minutes. Hopefully you guys will check this out and decide to give the Ventura County Greek Festival a visit. Remember, it’s going on today AND tomorrow, so you really have no excuse to miss out on the fun. Since this is as close as I’ll get in the near future to the actual Greek Islands I really want to go! My girls are in love with Mama Mia! so they want to go to anything with the word Greek in it. You make the food look awesome. I want to try the loukoumathes for sure! Thanks for the review mister! So glad that you went to a Greek Festival–they’re lots of fun! 2010 OC Greek Fest in Anaheim is the premiere Greek Festival in Orange County. This year will be our 49th Festival, May 21-23, and it’s going to be great fun, with lots of delicious Greek foods for our patrons, Greek music, and Greek dancing. With over 10,000 visitors last year, we know how to throw a glendi (party) and would love to have you amongst our visitors. Go to http://www.ocgreekfest.com for more info and free admission passes. So glad you had a good time in Ventura last June. Because you’re a fan of Greek food, we’re inviting you to “Come Home to Greece” in the OC. Please consider coming to 2010 OC Greek Fest in Anaheim the weekend of May 21, 22, 23. We’re hosting our 49th Annual Greek Food Festival and St. John’s knows how to throw a ‘glendi’ (party)! With many in our parish originally hailing from Hellas itself, you won’t find more authentic Hellenic cuisine outside of Greece (unless you have a yiayia–grandmother–in your kitchen!). We look forward to seeing you–make sure you go to our website and print your free admission passes! OPA!! Brian – Thanks for your blog. I’m the Ventura County Greek Festival Chairman this year, June 25, 26 & 27. Starting from scratch, fresh frozen calamari including crisp tasty tentacles (the best part). New menu item – Grilled lamb chops from rack of lamb served on top of seasoned Greek fries. I have tried them and they are excellent and easy to eat with a chop in one hand and a glass of wine in another. I have a digital photo if interested.